A tool chest is one of the most convenient pieces of furniture you can ever have in your garage. It can house sets of tools that might otherwise remain hidden or lost in the depths of your garage, and it can keep all your tools conveniently in one place when you’re working on projects. The best part is, many tool chests are also on wheels which means you can transport them to the job you’re working on, rather than move the project closer to the tool chest. Most are made of durable, heavy-duty material to last the distance, and come in vibrant colors to stand out in any workshop. While the majority of them are designed as lockable sets of drawers for socket wrenches, screwdrivers, and other small tools, there is also an abundance of options that cater for power tools as well. Instead of having to pile up ten different hard cases with saws and drills, you can instead store them within your tool chest, and even have some hanging up on display. Not all are created equally, so the key is to find one that suits your needs perfectly. Why not check out these nine top-rated options below? This Milwaukee tool chest is sure to be a favorite with mechanics, carpenters, and hobbyists alike. Not only does it cater for those who need somewhere to put their socket sets and screwdrivers, but it also well and truly ticks all the boxes for those with power tools as well. 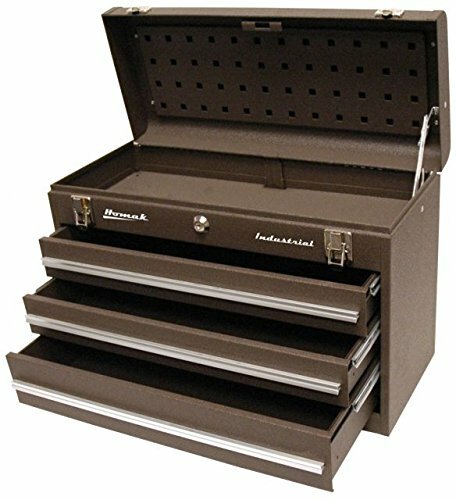 As a 46-inch, 8-drawer chest, it features heavy-duty drawers of varying sizes to cater to a range of tools. The bottom can house large power tools, while the top drawers have ample space for those smaller ratchets and items you may need at a moment’s notice. It’s entirely transportable, with four heavy-duty wheels and two powder-coated handles, and it’s vibrant in color to both stand out, and resist rust. However, it’s the top half of the tool chest that makes it stand out in a league of its own. Instead of having to open several drawers at once, you can store all your most commonly used tools on display on the top, with an area to both place them and hang them. On the side, you also have access to a power box which enables you to both hang and plug in your power tools for the day’s work. Everything about this chest says quality, and it’s well worth looking at if you’re in the market for a strong tool chest that will provide you with endless hours of convenience. If you’ve got a lot of tools and nowhere to put them, you need this Milwaukee tool chest. Designed to handle 1,400 pounds of weight, it’s solidly built and has gas struts and a recessed chest lid for your convenience. With 12 drawers, it can store all the tools of the trade with ease, all the while being portable with four wheels, and two handles. It has close to 20,000 cubic inches of space, has soft-closing drawers to prevent damage from slamming them closed, and even has a pegboard backing, so you’ve got both horizontal and vertical storage. If you’ve got lots of power tools, you will undoubtedly benefit from purchasing this tool chest. It has a pull-out work surface so that you’ve got plenty of space to use them, and they can be plugged into the power center which has room for six devices to be charging at once. If you’re all about organization, this tool chest has you covered. The biggest drawer at the bottom has a power tool organizer, and you can even store both power packs and power tools neatly in one place. Robust and made from 20-gauge steel, it’s built to last the distance for the carpenter or mechanic. If you’re tired of spending more time hunting for tools than doing the job at hand, it’s time to invest in a Husky tool chest. 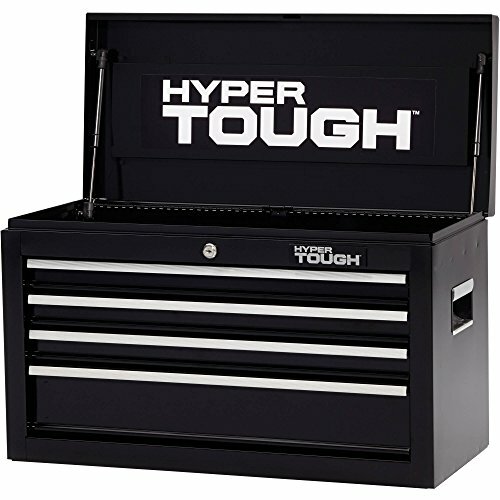 This 52-inch tool chest is designed to handle 1,800 pounds of weight, and each drawer will effortlessly provide support for 100 pounds of tools. It’s supported by gas struts, has robust steel welds, and even has ball bearing drawer slides to add additional convenience and support. When light-fingered colleagues help themselves, this Husky tool chest can put a stop to it. All drawers are lockable, so you just need to organize your tools how you want them, then lock it at the end of the day. Adding to the convenience on offer is the power port with four sockets for power tools. It also has two USB ports. It’s certainly more than just a chest for your tools; it’s an all-in-one unit that enables you to carry out all kinds of projects with ease. 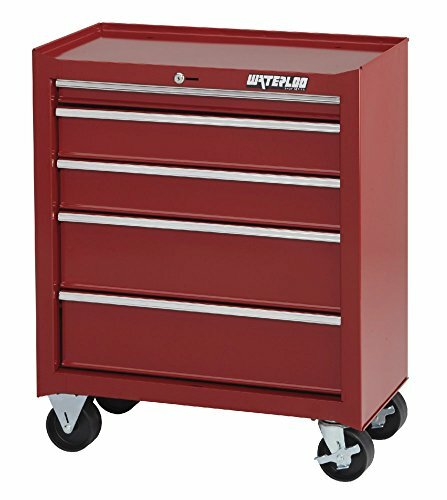 Affordably priced, robust, and attractive, this sharp Husky chest will make any mechanic or garage owner very happy. Most tool chest for sale both online and instore only comes as the shell. They offer plenty of drawers and space for both handheld tools and power tools but don’t come with the tools to fill it. As a result, you never truly know what size tool chest you will need. If your tools are looking past their used by date, as is your tool chest, you may just find this WorkPro mechanic tool chest could be what you need. It features a range of tools and comes neatly organized within a robust and portable tool chest. All of the 408 pieces are quality-made, and even your comfort has been thought of. The ratchet handles are ergonomically designed, and you will find they are easy to use with switch mechanisms and quick-release functions. If you’re worried about strength, rest assured no stone was left unturned in creating quality tools. They are forged with chrome vanadium for durability, strength, and of course, torque. The best part is, they look suave, with full-polish chrome to seal the deal. Meeting ANSI standards, these tools within this robust tool chest are everything you need to carry out minor mechanical and DIY work. You get the three-drawer chest with snap-shut buckles, but you also get screwdrivers, pliers, a hammer, a level, a tape measure, hex key, and more. Whether you need a spare set or you’re looking to upgrade, this chest complete with tools is the very thing you need. If you already have an Excel tool chest and need to expand it, or you’re in need of a compact little tool chest to sit atop your workbench, this chest is a good option for you. Not only does it stand out from the crowd with its unique shade of blue, but it’s also capable of storing many different tools – with a 50-pound capacity in each of the ball bearing sliding drawers. The body of it is powder-coated to be both scratch and rust resistant, and the handles make it easy to transport from one bench to another. If you’re worried about durability, you can also rest assured Excel has you covered. 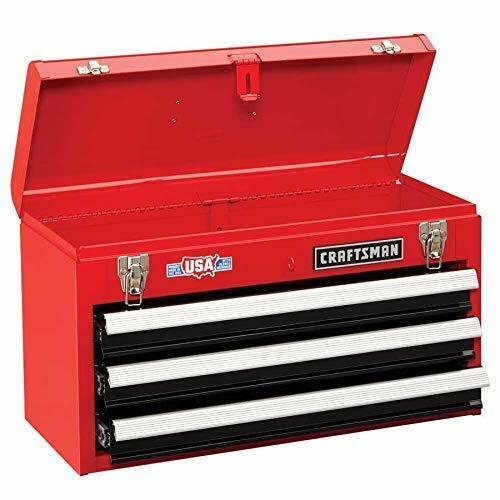 This tool chest is exceptionally well made, is durable to handle all kinds of daily use, and has recessed handles to ensure they don’t break or knock when they’re not being used. The drawers slide easily and offer plenty of room for different tools, and then you even get peace of mind from being able to lock it when it’s not in use. While it’s designed to sit atop another Excel chest, this box also works perfectly fine as a standalone unit, and it’s well worth its affordable price tag. Most tool chests come in standard workshop colors, and it becomes all too easy to mix yours up with that of your colleague’s. However, if you purchase a Viper tool chest, it’s almost guaranteed that you’ll never get yours mixed up with somebody else’s again. These chests, built from 18G steel, come in black, black with trim, lime green, pink, steel, and white. 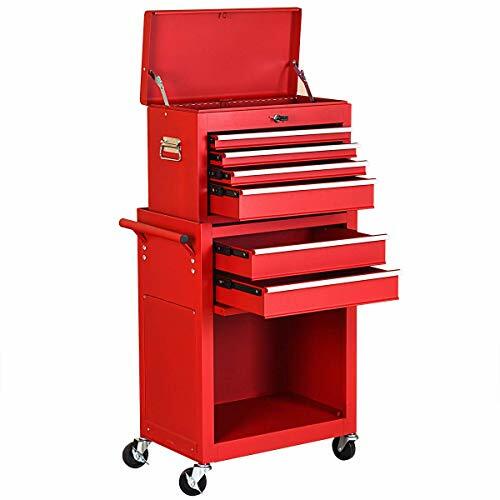 Instead of going with what’s typical – red or black – you can now choose a tool chest that helps you to stand out from the crowd. Are you a woman in the workplace who’s proud of her femininity? Opt for a pink tool chest. Or, do you want your workplace to ‘pop’ with a lime green tool chest instead? While they are built to be functional, customers can also benefit from the unique colors that make Viper stand out as a brand worth taking notice of. Aside from color, there is more to these tool chests than meets the eye. Each drawer can handle 100 pounds of weight, they have a cam lock and gas struts for a soft close, and are even powder-coated to be more durable and rust-resistant. Even if you want to move it, you’ll find that Viper has thought of everything, as it has two handles for one or two people to move with ease. Best of all, this chest comes with a limited lifetime warranty. Giving you peace of mind, you can now get to work knowing that any manufacturer’s issues will be fixed promptly. Whether you’re looking for a storage chest for the house or the garage, you’re sure to find that this mini tool chest from Viper will be a welcome accompaniment. While it is traditionally designed for a garage environment, due to its size and funky color options, there’s no reason why it can’t find its way into your house for storing easy-to-lose pieces. 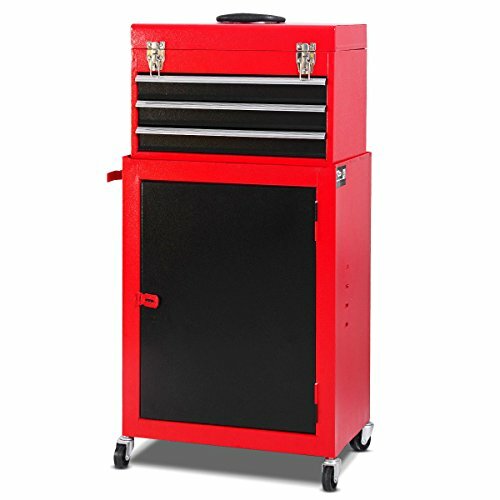 Bucking the trend of standard mechanic tool chest colors, you can buy this chest in orange, pink, lime green, black, purple, stainless steel, teal, and white. Whatever your color scheme or décor, there is sure to be a tool chest that suits it beautifully. Being small in size, it only has two drawers, but they are of equal quality to larger chests. They have a 50-pound load rate, slide in and out quickly on ball-bearing slides, and even have non-slip drawer liners that match the color of the chest. Finally, these tool chests are powder-coated to handle all kinds of pain and have a cam lock system to keep the drawers in place. Whether you use it for storage or tools, you’re sure to love the feeling of standing out from the crowd. 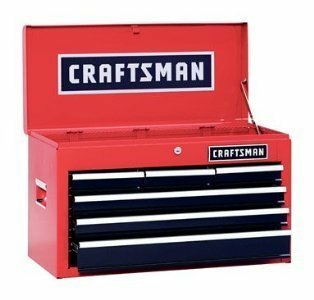 If you need a tool chest fast, but you don’t want to pay a lot for it, you might consider looking at a tool chest from HomCom. While it’s not the conventional shape or style of what you usually find for sale, that doesn’t make it any less able to store your tools safely and securely. It’s powder-coated to be durable, has six drawers, and has an opening top for additional storage as well. Three small drawers will prove useful for those finicky items, while the three larger drawers can house a range of bigger tools. To avoid items moving around in transit, or oil leaking out where it shouldn’t, this chest also comes equipped with EVA pads. These prove useful for both shock and oil absorption. Useful, robust and affordably priced, there’s every reason to opt for a tool chest from HomCom. If your tools are lying haphazardly around your garage because you move from project to project, you need this tool chest from Goplus. As a tool cart, it can go everywhere you can, and is designed to be always at your service. 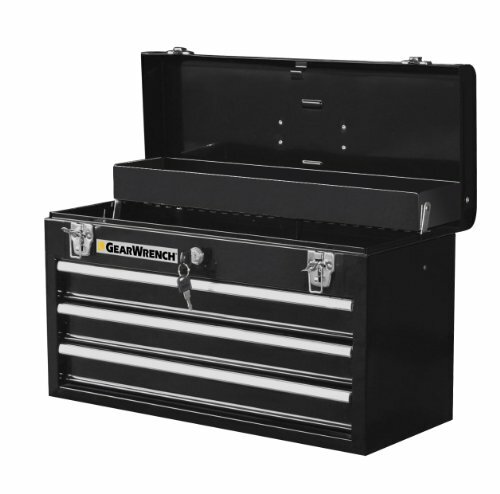 It has two drawers to house your essential tools and appeals to many mechanics due to its spacious top area for easy-access to your primary tools. Each drawer can handle 33 pounds of weight, it’s lightweight at just 176 pounds, and each of the four caster wheels locks in place, and move freely as well. 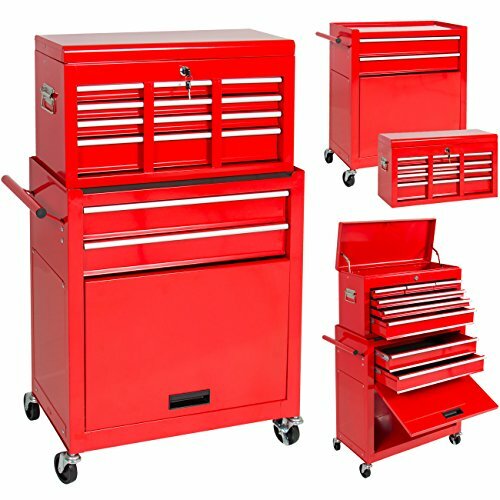 This tool cart is affordable and is suitable for both tinkerers and professional mechanics.